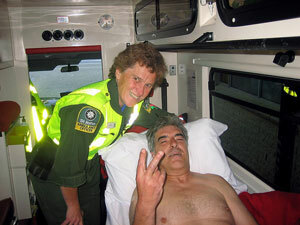 St. Pat's Brethren are optimistic that this injured car driver was giving us his vote of thanks!! Relief for the infirm, the less fortunate, or those merely requiring a friendly helping hand, is the philosophy that runs through Masons within the Irish Constitution, based around the world. Indeed, charitable benevolence was a central pillar supporting the structure when, centuries ago, the first Masonic Lodges were founded. In the 21st century, the ancient officerships of 'Steward of Charities' and 'Almoner' remain as important, active roles within any regular Lodge of Freemasons. 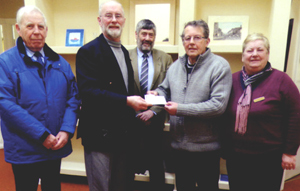 Benevolence has always been high on the agenda of Lodge St. Patrick and, in the past 12 months, the Lodge has been lucky enough to be able to donate to a wide spectrum of causes, assisting with small amounts, and not so small, as funds have become available. 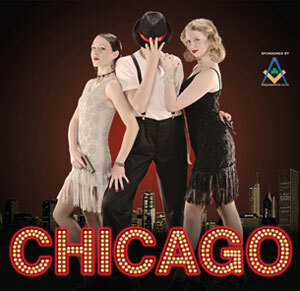 Lodge St. Patrick helped to support Bayfield HS's show CHICAGO. Sam Shannon (L) and Claire Steel were the female leads. 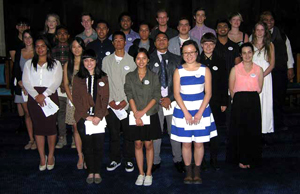 On February 8th, the top 2012 Year 13 students from 25 of Auckland City's secondary schools received $1,250 each, at the annual 'Ara Fine Arts Awards' ceremony which is sponsored by Ara Lodge 348. The awards are always held on the nearest Friday to the birthday of Ara Lodge, 9th February 1843. 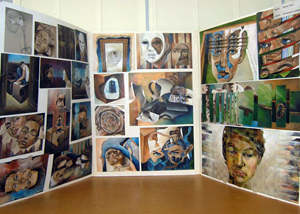 Pupils, parents, teachers and guardians attended the event from the early evening when the students' portfolios went on display in the refectory for all to view. Paintings by Bonnie Harvey (Diocesan School) and Sonny Youn (Glendowie College) were on view at Ara Lodge. At 7:00pm the next stars on display were the Master of Ara Lodge W.Bro. Roger Grove who welcomed all to Ara Lodge's Visual Fine Arts Awards ceremony, and V.W.Bro. Geoff Grenfell who opened the proceedings and acknowledged all those "backroom boys" (and girls) who had a part in bringing the 2013 awards ceremony to fruition. Two piano solos from 10-year old Northern District Knights Templar Foundation scholars entertained those in attendance. Sophia Chiang played 'Polka' by Tchaikovsky and Catherine Chiang, 'Fantasie Impromptu', Choppin's Opus 66. The worthy recipients of Ara's visual Art Awards. 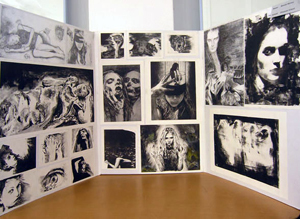 The guest speaker, David Craggs, praised the students for the quality of their portfolios and urged them to continue their study into the arts. 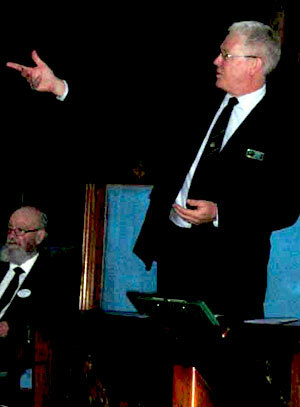 The Worshipful Master, Roger Grove, and Rt.W.Bro. Roland Whyte, the Provincial Grand Master, then presented each pupil with a certificate and a cheque for 1,250 dollars to assist them to further their studies. Andrew Strachan, HoD Art, and Alex Popham, a past-Ara Art Award recipient, a scholar from ACG Senior College, thanked the Brethren of Ara Lodge for continuing its art awards, and for the well-attended ceremony. Kirsty Hamilton was a recipient of an arts grant to assist her to travel to study Shakespeare at William Shakespeare's home town of Stratford-upon-Avon in Warwickshire, England. On her return from England, Kirsty attended the Lodge to provide Ara's members with an excited and enthusiastic report on her journey and studies. Among a long list of charities assisted by Ara Lodge this year was the Auckland City Mission which benefitted from a donation of $1,200 toward their Christmas Appeal. De Burgh Adams Lodge has always been a very community minded Lodge, always willing to help relieve the needs of the afflicted and charitable causes in the Taranaki Region. These are just two of the charitable organisations that have benefited from De Burgh Adams' generosity. Our sister Lodge, the Lodge of Light in Thames, frequently assists needy persons and charity organisations within the Coromandel community. 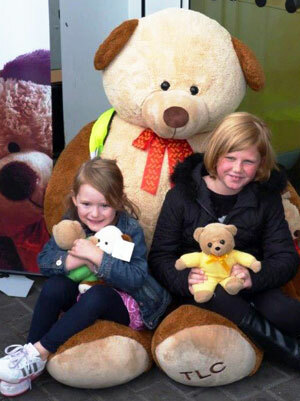 Big Ted is pictured with three recipients of Teddies for Loving Care … and some hangers-on. The Grand Lodge of Ireland launched 'Teddies for Loving Care' (TLC) in Dublin on Saturday, 7th September. TLC is a charity for the benefit of distressed children attending emergency departments in hospitals all over Ireland. 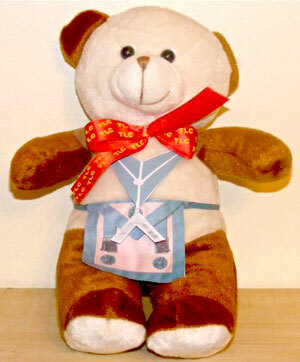 Funds are donated to purchase Teddy Bears: the Teddies are then provided to the hospital emergency departments to enable medical and nursing staff to distribute them, at their discretion, to children who are admitted in severe distress, and were the staff member feels that a Teddy to cuddle will help alleviate the child's anxiety, thus assisting the staff to continue their important work. Clothed in his Masonic regalia, Big Ted attended the Grand Lodge of Ireland in Dublin. Past professional experience has shown that young children admitted to A&E Units are invariably frightened, in strange surroundings, and being treated by strangers carrying out often painful procedures simply adds to their suffering. A Teddy is a 'security blanket' to which to cling, a distraction, and occasionally even doubles as a device with arms and legs that staff can use to demonstrate bandages, plasters and sometimes injections. This initiative has been running in the UK for some time and it was due to our strong links with the English Constitution that W.Bro. Ian Simpson of the Skillet & Trowel Lodge No. 981 in England, and R.W.Bro. Phillip Daly, Chair of the Metropolitan Board of G.P. in Dublin, joined up to kick-start fundraising for the TLC programme within Freemasons' Lodges throughout Ireland. Big Ted and his three cousins being cuddled by two of his ardent fans. All at Lodge St. Patrick in New Zealand wish our sister Lodges in Ireland in the Irish Constitution well with this burgeoning project to bring comfort to afflicted children, and feel assured that the generous donations received thus far are merely a foretaste of what is yet to come. Tuesday, 29th May 1738 saw the Antient Brandon Lodge No. 84 consecrated so, in June last year, the Grand Master, M.W.Bro. George Dunlop was on hand to help the Lodge celebrate its 275th birthday. Based near Cork in south west Ireland, Brandon Lodge has, over the years, raised thousands of pounds for worthy causes within its compass and, God willing, will continue to so do for the next 275. W.BRO. 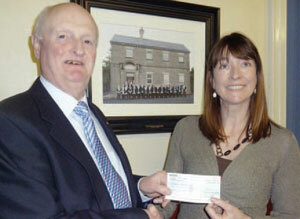 PARKHILL PRESENTED REPRESENTATIVES FROM THE MS SOCIETY IN NORTHERN IRELAND WITH A CHEQUE FOR £1,300 POUNDS. The fifth annual charity breakfast hosted by Cary and Dunluce Masonic Charity Committee, County Antrim, took place on Saturday, 9 November 2013 at the Bayview Hotel, Portballintrae, and raised much needed funds for Multiple Sclerosis and the Alzheimer's Societies of Northern Ireland. Between 7 and 10am the hotel served more than 210 breakfasts. After the breakfast rounds a raffle was held with some very worthwhile and timely prizes being awarded. Concluding the happy occasion, the committee chairman, W.Bro. Derek Parkhill of Lodge 57 in Ballymoney thanked everyone who attended and supported the event and, needless to say, the hard working Bayview Hotel staff for furnishing the first-rate food and facilities. Later in December 2013 representatives from both the Multiple Sclerosis Society and the Alzheimer's Society assembled in the Bayview Hotel along with several committee members to be presented with their cheques. W.Bro. 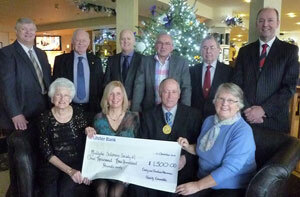 Parkhill presented each charity with a cheque for £1,300. Representatives from the Alzheimer's Society and the Multiple Sclerosis Society thanked everyone for their generosity and expressed their sincere appreciation for the desperately needed donations received. The monies raised will be staying in the north Antrim area to help and assist those that require it. The I.P.M. of Broomhedge Star 335, W.Bro. 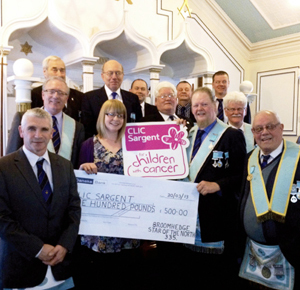 Richard Broadhurst (R), is shown donating £500 to Christine McClune from the children's cancer charity, CLIC Sargent. Kilbride Primary School in Doagh, Ballyclare, County Antrim, were the grateful recipients of a £250 gift from Doagh Union Masonic Lodge No. 317. Through lack of money, the children's annual sports day was threatened with abolition until the Lodge stepped and literally 'saved the day'! P.A.G.M. R.W.Bro. Jack Dunlop was on hand to present their cheque. Through various methods; indoor bowls tournaments, clay pigeon shoots, BBQ lunches, Lord Arthur Hill Lodge No. 147 has raised money for the Helping Hand Royal Belfast Hospital for Sick Children, to assist them to purchase a MRI scanner. This was originally an initiative of the late W.Bro. Gary Briggs and his wife, Anne-Louise, who raised thousands for the hospital since their boy, Jonathan, was diagnosed with a brain tumour in 2010. Aged just 8, Jonathan sadly passed away in 2011 but, through the Lodge, his legacy will benefit hundreds of sick children for many years to come. 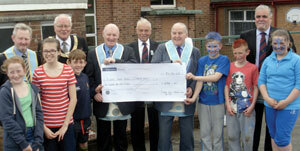 A donation from Doagh Union Lodge literally 'saved the day' for Kilbride Primary School, Ballyclare, Co. Antrim. 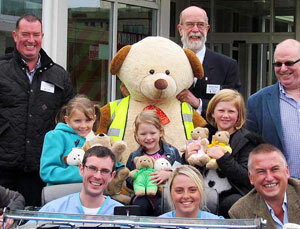 Based in Blaris, County Down, Lodge 147's latest venture is to procure funding for Belfast City Hospital's renal unit. Based in the hamlet of Magheralin, south west of Lisburn, County Down, Magheralin Lodge No. 184 raised £200 to assist the funding of Cancer Focus Northern Ireland. Master of Star of the West Lodge 130, Tom Ryan presents a cheque to Michael Murphy, Chair of the Rockmount Day Care Centre. Rockmount Day Care Centre in Kilgarvan, County Kerry, provides facilities for the elderly in their area. Such care has to be a constant drain on meagre resources and so, when W.Bro. Tom Ryan, the Master of the Star of the West Lodge 130, turned up and presented Rockmount staff with a cheque for €700, it was gratefully received. 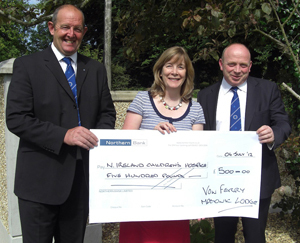 The Master of Magheralin 184, Harry Latimer presents Sandra Gordon of Cancer Focus NI, with a cheque for £200. 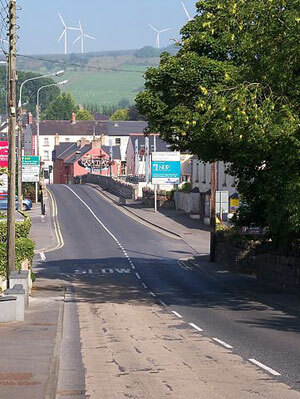 The small village of Broomhedge in County Antrim punches above its charitable weight, being as it is, the location of Star of the North Lodge No. 335. This year the N.I. Children's Hospice and also the children living with cancer charity, CLIC Sargent, were the beneficiaries of donations from Star 335, with both organisations receiving £500 each. Drew McCurdy, WM of Vowferry Lodge No. 17, presents a cheque for 500 Euros to Valerie Peacock of the N.I. Children's Hospice, as I.P.M. Mark Rea (R) looks on. We are able to list but a few of the many gestures of relief proffered daily by Lodges of Irish Masons all over the world but be assured that where there is genuine need, there you will find the outstretched hand of a Freemason offering his support.